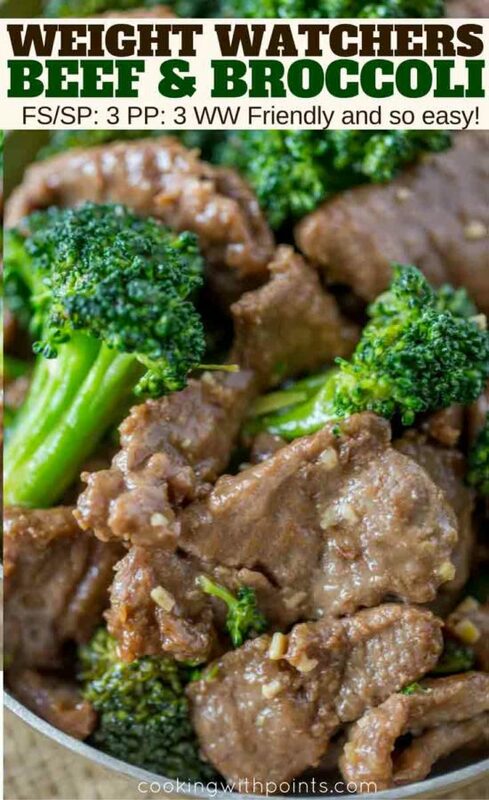 Beef and Broccoli is a healthy Chinese food option with tender slices of meat and tender broccoli in less than 30 minutes and just a few ingredients! 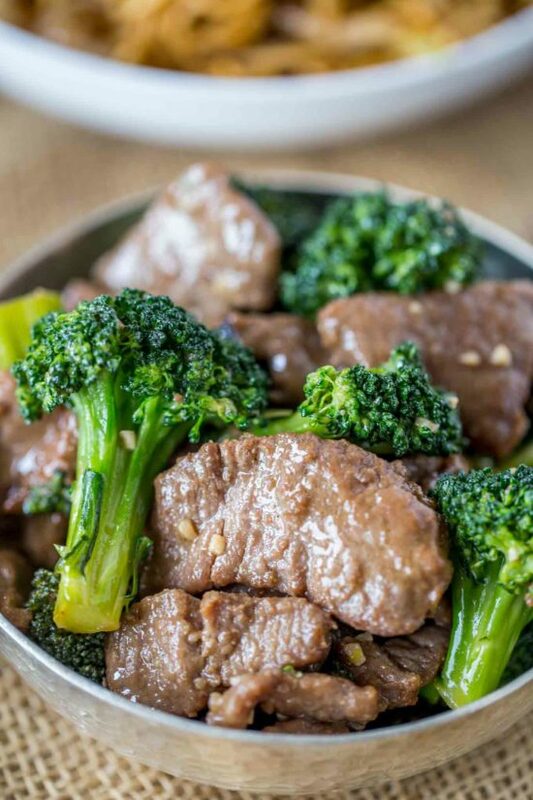 Beef and Broccoli has long been one of the best, healthiest Chinese food options at restaurants and take out options like Panda Express. Plus unlike most Chinese food recipes this one only takes a few ingredients and you probably already have ALL of them in your cabinet. 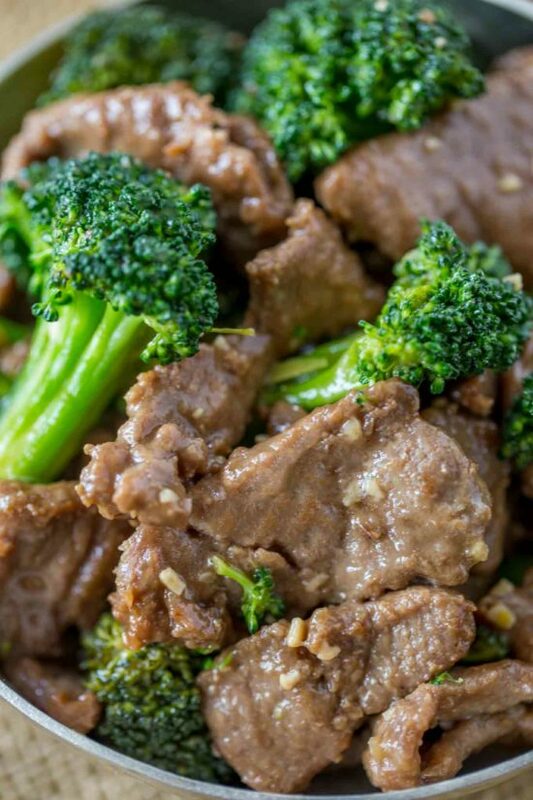 Beef and Broccoli from Panda Express is one of our go to options every time we eat there. In fact Panda Express is a great option for people who are on a diet. My go to is Beef and Broccoli, Mushroom Chicken and Steamed Veggies for hardly any points at all. In fact during busy weeks I would eat there multiple times a week. 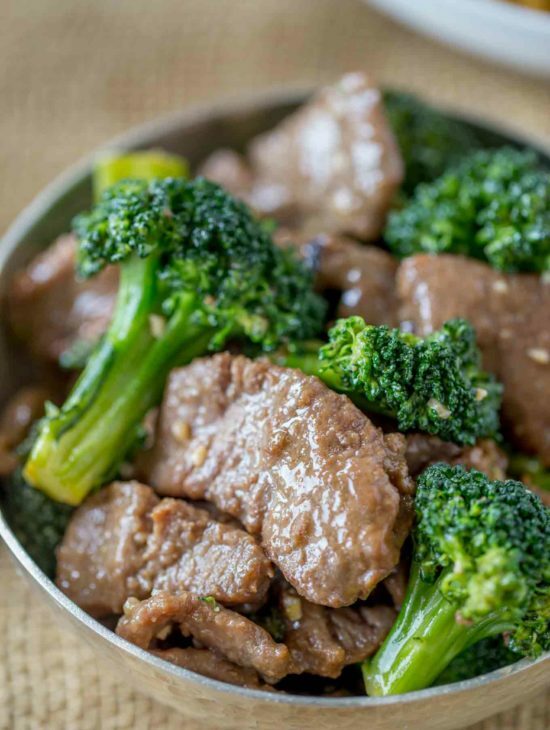 This beef and broccoli is tender, delicious, and quick to make. The most important ingredients are sesame oil and oyster sauce. They also are only 3 total points in the recipe. Tons of flavor doesn’t have to take a lot of points. Get the pan nice and hot. Sear the beef quickly and get it out of the pan to avoid it becoming tough. Cut against the grain. This is the most important way to make lean cuts of beef tender. If you have the time (this isn’t in the recipe) you can even use a mallet to tenderize each piece (note: this isn’t necessary but will make the beef more tender!). This breaks the connective tissue. Have all the ingredients ready to add so nothing burns, this cooks fairly quickly. The longer you can marinade the better. Sesame Oil: Tons of flavor in a small amount used, this is crucial to Chinese food cooking. 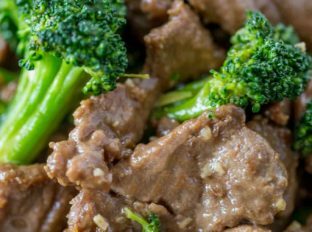 Oyster Sauce: This adds a ton of flavor and is used in beef and broccoli as well as, most notably, fried rice with great results and low points. Wok: Perfect size for cooking the beef as well as steaming all that broccoli in the sauce. Add everything except the canola oil, garlic, ginger and broccoli into a large bowl and mix well, and let marinate for at least 15 minutes. In a wok add 1 teaspoon of the canola oil on high heat. Add in half the beef and cook for 1-2 minutes on each side. Remove from the pan, add in another 1 teaspoon of oil and add in the remaining beef and cook the same amount of time before removing from pan. Add in the last teaspoon of oil and add in the garlic and ginger. Stir and cook for 30 seconds, then pour in the marinade and broccoli, cover and cook until the sauce thickens. Add in the beef, stir together to coat and serve. One of my fave Asian dishes! Thanks for all the extra info about the sauces and cooking tips! Tell me about it! I’m trying my best to get my kids eating healthy too! Only three points?! OMG! I love this dish! This is my new favorite! This looks delicious and easy to do! I printed the recipe so I can fix it next week. I am always looking for lighter dinner recipes. Panda Express is one of my favorites and I am so excited we are finally going to get one in our town! Hope you enjoy it! I live for Panda Express it is so easy and on point! I made this tonight for my family; everyone gobbled it up. Thank you. Will be trying other recipes soon. Happy to have found your site. I made this for dinner tonight and everyone loved it! Thanks for all the recipes! Any recommendations on a substitute for oyster sauce? The recipe sounds great except for that ingredient; personally I can’t stand any seafood related flavors. I’m so sorry this ended up in spam. If you are averse to the seafood flavor, use a Mushroom version which is also delicious!